In 2017, Las Madrinas committed to a $5 million capital and endowment project – The Las Madrinas Endowment for the Chief of Neurology Chair and the Neurological Institute Epilepsy Program. Funds raised by Las Madrinas will be a crucial investment in CHLA’s Neurological Institute, a first-of-its kind program that brings together experts from the Division of Neurology and Division of Neurosurgery under one roof to provide well-coordinated, comprehensive treatment. This collaboration facilitates an unsurpassed continuum of care, allowing an interdisciplinary team of specialists to guide approximately 16,000 infants, children and adolescents who have neurological conditions throughout all stages of illness—from diagnosis to treatment to surgery and rehabilitation—every year. The Las Madrinas Endowment for the Chief of Neurology will establish a secure source of funding for the chair holder to pursue the Division’s most pressing—and promising—clinical care, research and education initiatives. Existing in perpetuity, this endowment will produce guaranteed annual income, providing the chief with the financial resources to advance neurological care at Children’s Hospital Los Angeles to even greater heights. The inaugural chair holder was Division Chief Douglas Nordli Jr., MD, a leader in the pediatric medical community who has dedicated his career to helping children facing debilitating neurological conditions heal and thrive. While the overall purpose of an endowment remains constant, the specific projects the chair propels can change as medical science and the Division’s priorities evolve. The endowment will also strengthen the institution by serving as a valuable tool to recruit and retain the most talented faculty and, as a result, attract even more great minds, philanthropic support and grant funding for the hospital. At its core, this vital form of support will help shape countless futures by ensuring the Division will always have strong leadership to improve patients’ lives today and tomorrow. Epilepsy can take a devastating physical and psychological toll on patients and their families. 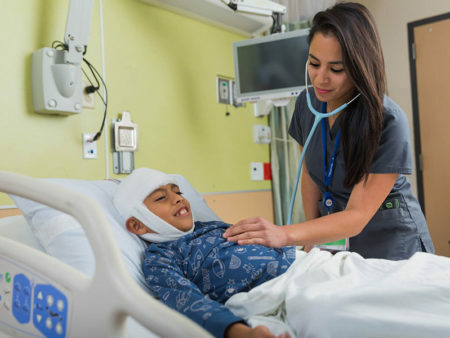 Although there is no cure, the Neurological Institute aims to help children lead a seizure-free life with promising treatment plans that often begin with electroencephalograms. Conducted in the Epilepsy Monitoring Unit, these tests measure and record patients’ electrical brain activity using electrodes attached either on the outside of the child’s head or directly on the brain. This provides epileptologists with valuable information to determine exactly where a patient’s seizures are originating and use that information to target and control the disease. Support from Las Madrinas will fund a substantial expansion and upgrade of the Epilepsy Monitoring Unit at CHLA that will enable the Institute to double the number of patients who can be monitored at once and enhance the experience that patients and their families have in the unit. Purchase portable and wireless monitoring systems that can track a patient’s brain activity without disruption, anywhere in the hospital, particularly during surgery and the recovery period. The Las Madrinas Endowment for the Chief of Neurology Chair and the Neurological Institute Epilepsy Program will ensure that children in our community with a neurological disorder can always rely on Children’s Hospital Los Angeles for the highest-quality care, the type of care that frees a child from debilitating seizures, helps a teen with muscular dystrophy regain strength and creates hope for patients diagnosed with a brain tumor.